Are you considering the use of perforated metal for your products? Are you having trouble determining which of the various hole types is best for your applications? Slotted hole perforated metal could be your best choice if you’re looking for an elongated hole, as opposed to a round or square shape. Slotted perforated metal is a sheet of material that contains holes punched by a slotted die. The die can vary in width and length, and the ends of the slot can be round or square. Slot width 0.125" – 0.2"
Slot length 0.1" – 0.75"
Slot side bar 0.125" – 0.25"
Slot end bar 0.125" – 0.25"
Surface treatment Electric galvanized, hot dipped galvanized, PVC coated, and oxidation treatment. In its solid state, Perforated Metal Sheets are smooth with a high strength ratio especially when round holes are used. This makes it ideal for forming into three-dimensional shapes to increase strength and rigidity. Perforated Metal sheeting is ideal for applications such as ceiling tiles, cladding, lamps, balustrade infill and much more. We carry perforated metal in a wide array of hole shapes, sizes, gauges and material types. The most common applications for perforated metal include screens, diffusers, guards, filters, vents and signage to name a few. 5.Protective fences of overpasses and machine equipment. Open area is the total area of the holes divided by the total area of the sheet and is expressed as a percent, Keep in mind that punching holes in a material add stresses that can result in distortion of the product. The higher the open area, the more material distortion takes place, especially when the perforated pattern is bordered by margins on all four sides. But these distortions can be removed by our special in house leveling process. Our team can create customized margins for your specific project, giving you the ability to achieve just the right design or appearance. We take care to meet your specifications in terms of distance between perforated sections to the end of the sheet; or as with our selective area margins, sections within the existing perforation that are left alone. Our offerings include intermediate margins, safe side margins/min margins, end margins, side margins, selective area margins, no margins and skip feeds. 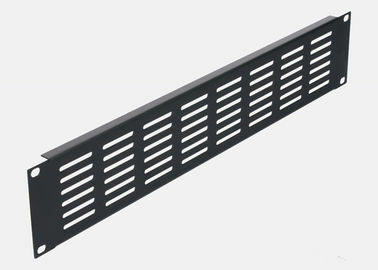 Do you require a specialized hole pattern for your perforated slotted metal? Our facilities include an in-house fabrication department where we can create the customized product you desire. We are committed to providing the exact solution every customer needs to meet his or her business goals. Feel free to supply us with your own blueprints and drawings and we will do the rest!